Database administrators (DBAs) and operators need to track changes across SQL Server to ensure that users and customers have the ongoing access to applications and data they need, because even a small change, such as updated columns or a modified role, can cause disruptions, put a database out of service or even lead to data loss. With SQL Server change tracking in place, supported with insightful reporting capabilities, you can proactively spot and uncover database security threats and chase down suspicious or incorrect actions before they cause any damage. What if a primary key was altered or permissions to a stored procedure were updated without you being aware of it? Is it enough for you to track SQL Server only with change data capture (CDC) to know if there has been any change to your current version of tables? Without reliable, efficient SQL Server change tracking you can’t gain control over what’s going on across your SQL servers. Using SQL Server change tracking capabilities offered by native tools helps you enable some change tracking functions; for example, you can see who deleted which tables or what rows were changed. But to benefit from native tools, you need to be able to write a set of queries in Transact-SQL to get change tracking information — for instance, about modified columns or user-created tables — and this task can easily devour your precious time. On top of that, you must constantly do auto cleanup to ensure your SQL Server doesn’t run out of disk space with change tracking enabled, or performance and availability will suffer. 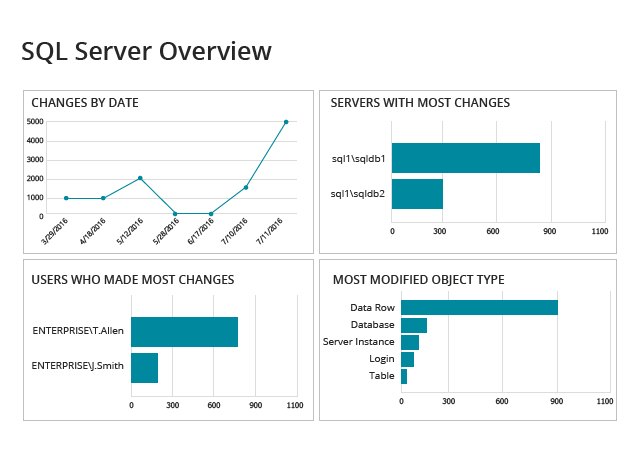 Unlike native change tracking tools that require you to write queries and manually crawl through data, Netwrix Auditor for SQL Server offers prebuilt dashboards and reports that enable you to easily spot changes — for example, track a column that was deleted or a user role that was modified — along with the before and after values of each change. The Interactive Search feature helps you further investigate suspicious changes and get to the root cause of the problem, so you can prevent database unavailability or disruption. This precise SQL Server change tracking supported with actionable intelligence helps you keep an eye on key resources, such as the servers with the most changes and the users who made most changes. Report subscriptions keep you updated automatically on the schedule you choose. And there’s no more need to worry about cleanup, because Netwrix’s two-tiered storage keeps your consolidated SQL Server change data for more than 10 years and ensures quick and easy access to it at any time.